Rising, aced or below par, it’s time to gauge your true footing! 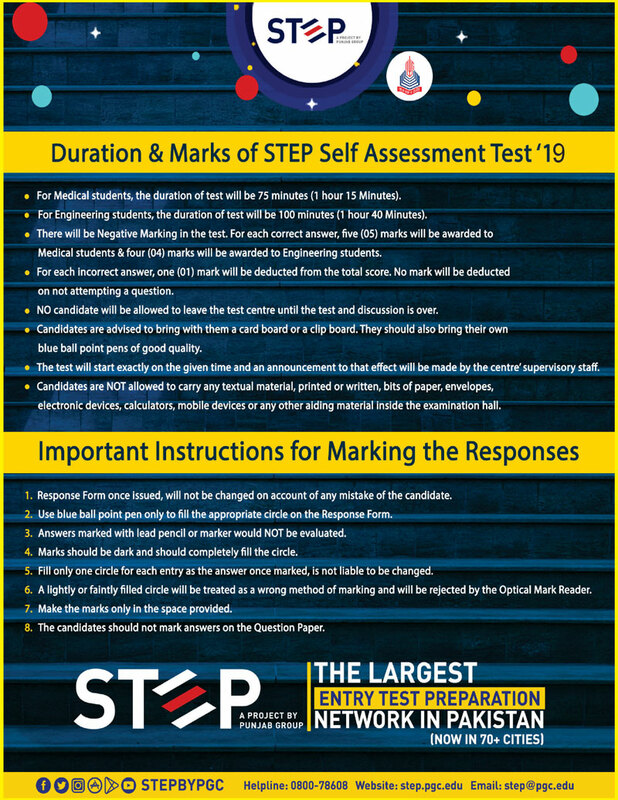 STEP brings a golden opportunity to assess your preparation for Medical, Dental, and Engineering Institution’s entry tests. Carrying the legacy of Punjab Group of Colleges, STEP is striving to equip students with the arsenal requisite to outshine in the academic world. 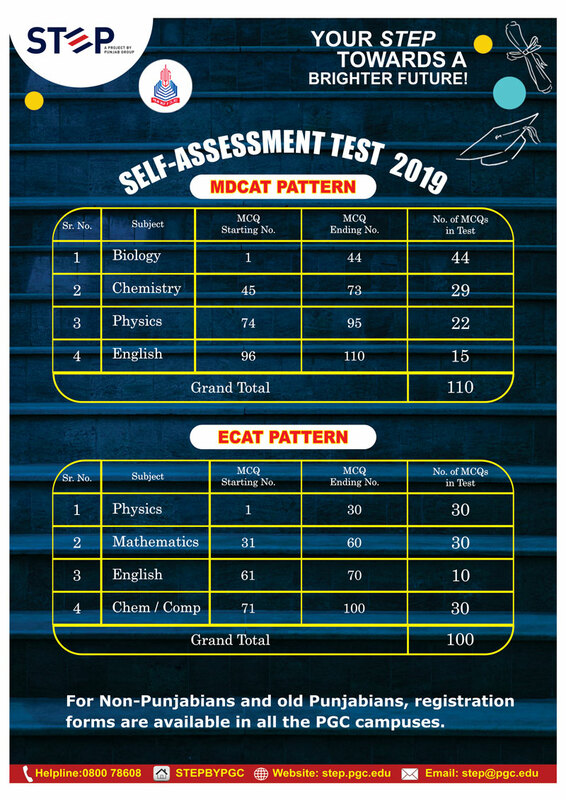 STEP Self-assessment test (SSAT-19) is a perfect blend of criteria & preparation requisite for Pakistan’s well reputed professional Medical, Dental, and Engineering Institutes entry tests. 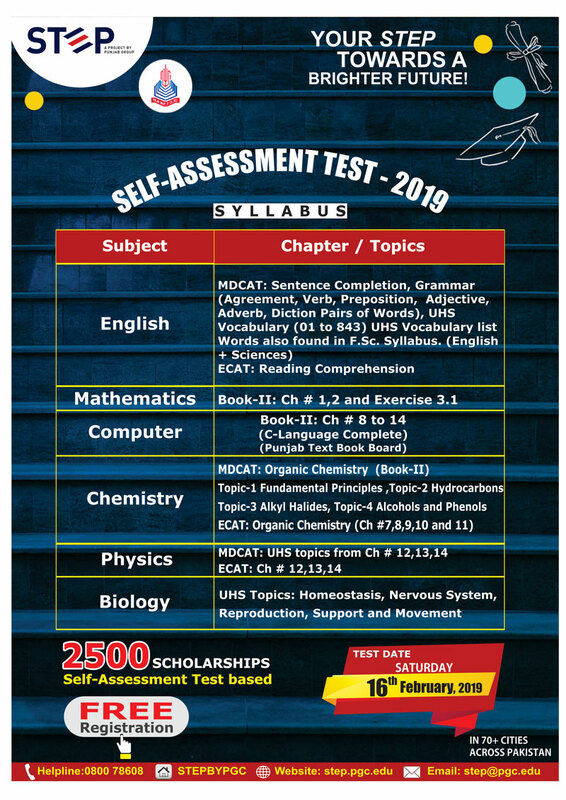 Striving for excellence, STEP Self-Assessment Test ’19 welcome students to come and appraise their standing for the entrance test. Come and avail this propitious chance on Saturday, February 16, 2019. This highly productive STEP Self Assessment Test 19 is going to benefit students in 70+ cities of Pakistan. STEP, Self-Assessment will serve students on two levels. On the first level, they will get a clear picture regarding their preparation. On another level, this test will provide detailed information regarding the entrance test for Medical, Dental, and Engineering Institutions. Eulogizing the success of our high fliers, STEP will be conferring Free Education to 2,500 Top Scorers of STEP Self Assessment Test ’19 (1,500 Medical & Dental and 1000 Engineering categories). Seize the chance and take a STEP to light up your future.